Installing pavers in the walkway or patio will surely complement the style of your home. It is guaranteed that your home will achieve an extra level of elegance through pavers. Its aesthetic value is probably the reason why pavers today are very popular among homeowners who want to uplift their home's appearance and functionality. The only setback however of having pavers is they are more prone to stain and dirt. Pavers are constantly exposed to extreme weather, pollution and dirt. 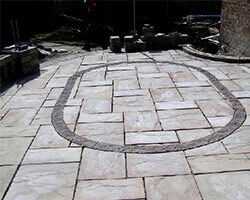 Unsealed interlocking pavers are also very susceptible to staining and chipping through the cracks and edges. Its high porosity also makes it more prone to salt efflorescence and its surfaces are porous so it can absorb oil quickly. The longer the oil remains in your pavers, the deeper it sets thus making the stain in the pavers permanent. With all these, regular cleaning and sealing of pavers must never be put off. 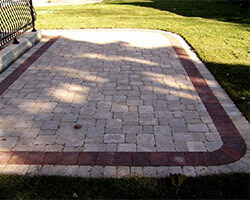 There are many landscape contractors in Illinois who offers clean and seal services for pavers. But if you want top of the line service and highly trained staffs, the pavers-clean and seal services of Ruff Landscaping is the answer to your dilemma. Through our services, your pavers will be effectively protected from the damages of different external factors such as fungal manifestations, acid and inclement weather condition. Our team will create a film on your paver to repel water damage and stains caused by external factors. Through sealing, it will definitely renew the surface color and also provide protection from efflorescence. Our clean and seal services will also prevent stain absorption and deter the growth of algae, mold, and weeds. You don't have to worry about constant cleaning and maintenance. And since cleaning and sealing will keep your pavers protected from the formation of unwanted microorganisms, pavers will all the time look clean and properly maintained. And lastly, newly cleaned and sealed pavers will further provide an aesthetic appeal to your home as it will substantially deepen the color of your home's pavers. Why Choose Us for Pavers Maintenance Job? Illinois residents should not worry if they have problems with their pavers. If you are living in Elgin and nearby areas, Ruff Landscaping is the right company who can effectively clean and seal pavers. Backed by years of experience, our company can surely provide you with excellent results in cleaning and sealing. To provide you with effective cleaning and sealing, Ruff Landscaping is also equipped with all the necessary tools and supplies to make the job easier, faster and successful. Our list of growing clients could attest on how we perform our job. Take time to browse the testimonials of our clients and you will be amazed at how much they value and appreciate the results of our cleaning and sealing services. Aside from our pavers maintenance services, Ruff Landscaping also offers other hardscape and landscape services to help you create the perfect outdoor haven for your family and friends. Whether you own a residential or commercial area, never hesitate to contact Ruff Landscaping for any pavers cleaning and sealing project.